 Cutting vinyl letters for signage or creating vinyl decals is generally done by machine. Some crafters may choose to learn how to make vinyl letters by hand, but in an industrial setting, that process is far too time consuming. 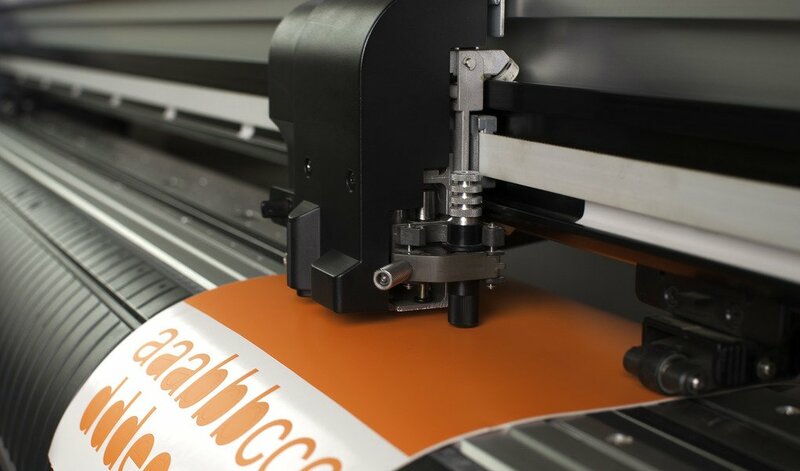 Cutting vinyl letters, however, is only the first of three main steps involved in getting custom vinyl lettering or custom decals to their final destination: applied to the intended surface. The finishing steps also include weeding and application. There are a few sub-steps, as well, depending on the type of vinyl decals you’re dealing with. If you’re applying a multi-piece graphic or sign, as would be the case with vinyl letter decals, you will also have to apply transfer paper to the front of your work. Transfer paper keeps all of the pieces in place. For one-piece vinyl decals, you’ll only have a backing to remove before you apply them. To make it easier to remove the backing cleanly, you’ll want to create crack-and-peel slits. This involves removing the unwanted vinyl within a graphic—like, for instance, the enclosed bits in the As, Bs, and Ps of vinyl lettering. If any parts of these interior excess bits are stuck to your graphic or vinyl lettering, you can use your cutting tool to carefully trim the final shape. You’ll also need to cut away the excess vinyl around your sign or graphic. These tasks require cutting tools that can handle detailed work around many different shapes, and can cut straight lines. A metal-bladed craft knife is a common tool choice for this job. Unfortunately, the metal blades are dangerously sharp out of the box, and those blades dull quickly because metal is relatively soft. The blades must be sharp to make clean cuts, so many vinyl sign-makers are tasked with frequent blades changes. Handling a blade is a high-risk time for lacerations or punctures. Using a dull blade is also dangerous, however, and may additionally result in tearing or tugging on your vinyl, so those blade changes are important. Slice cutting tools feature blades with our patent-pending finger-friendly® grind: these blades are safe to the touch. Our unique blade design also takes advantage of the fact that zirconium oxide is a very hard material: Slice blades have been tested to last up to 11 times longer than steel. All Slice tools are also ergonomically designed, which makes them easy to use and reduces hand and forearm fatigue. The handle surface provides a no-slip grip to reduce the chances of losing control of your tool. There are several Slice tools that will work well for finishing your vinyl signs or graphics: our micro-ceramic-blade knives, Precision Knife, and craft knives. Slice offer three one-of-a-kind cutting tools that feature our unique micro-ceramic blade: the Precision Cutter, Safety Cutter, and the Safety Cutter Ring. The Precision Cutter handles like a pen, so the motion feels familiar and natural. This tool is maneuverable and is excellent for detail work. The Safety Cutter and Safety Cutter Ring work well for straight cuts and big curves. The mouse-like shape of the former fits snugly in your hand, while the latter becomes an extension of your finger. 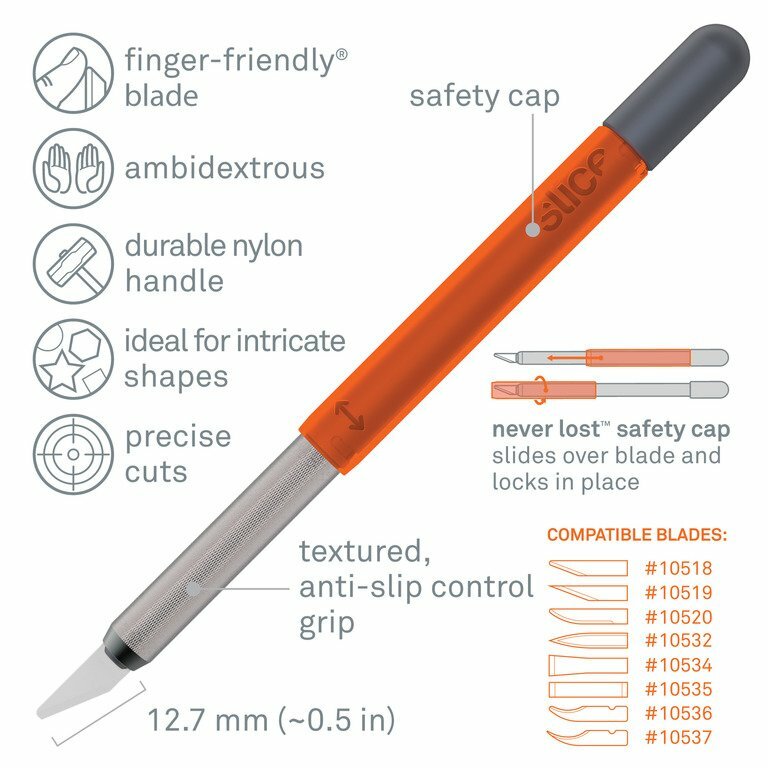 Slice makes two models of craft knives: the Craft Knife with removable safety cap and the Craft Knife with integrated safety cap. These tools handle like a traditional craft knife. 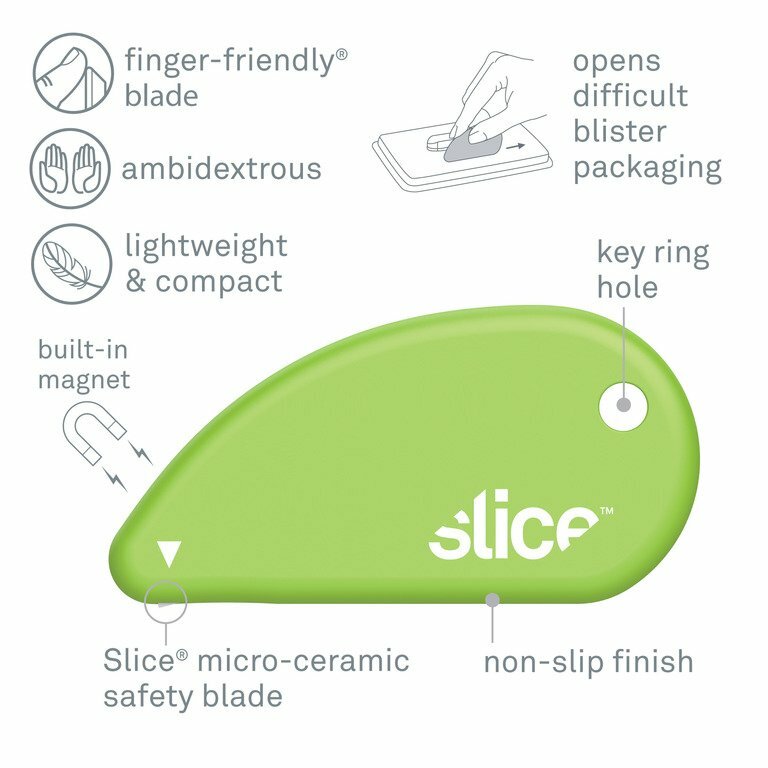 There are several different types of Slice’s proprietary safety blades that fit these tools. For the purpose of weeding, the pointed-tip craft blade and pointed-tip seam ripper are excellent choices. Each of these are great for detailed work and for delicately easing vinyl from the backing. The rounded-tip craft blade is a good choice when extra safety is called for. The Precision Knife fits the same blades as the craft knives. The unusual finger-hole design of the handle provides excellent control. These three tools—the craft knives and precision knife—are good for detailed work, and also for straight lines. If necessary, you can use a straight edge to help guide these tools when you need to make extra-long cuts. Making Crack-and-Peel Slits: Multi-$1,000 Machine or Under-$10 Slice Cutter? To remove backing from a single-piece decal, you can wedge your fingernail between the backing and decal to expose the decal’s sticky side. But this is a hassle, and with larger works, it can get cumbersome. To ease this process, it’s best to create a slit in one or more parts of the backing, depending on the size of the decal. Bend the decal slightly at the slit, and the backing will peel away easily. The only glitch in this plan is that the machines that make such slits are prohibitively expensive for small businesses. But don’t despair! Slice customer Blue Collar Skateboards sent in this video which shows how easy it is to create a crack-and-peel slit with the Safety Cutter. Whether you’re looking to make crack-and-peel slits or to do the finish work after cutting vinyl letters, Slice offers ergonomic safety cutters for the job.